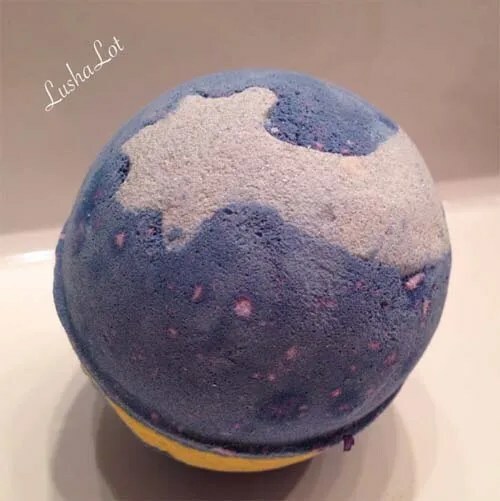 This photo is of the original style Shoot for the stars bath bomb. This year 2016 Lush has re-designed Shoot for the Stars bath bomb. You’ll love it even more, It’s gorgeous! This bath bomb just happens to be in my Top 5 Lush bath bombs of-all-time. Description: A bewitching bath swirling with colours as magical as the starry night, this bath bomb has the same comforting honey-toffee fragrance as our Honey I Washed the Kids jelly, soap honey bee, etc.. The water becomes sparkly and deep blue-ish purple! Absolutely wonderful. Below is the original style of Shoot for the Stars, this Christmas, Lush has redesigned it, and it is even more stunning looking! I’ll make a demo and review video when i use the new one in the tub. Here’s a the video i made of ‘Shoot for the Stars” in the bath. Posted on August 27, 2015 by Lushalot	• This entry was posted in Bath Bombs, Christmas 2016, Christmases Past and tagged bergamot, brazilian orange oil, christmas 2013, christmas 2014, Christmas 2015, Christmas 2016, demo, honei i washed the kids, honey i washed the kids scent family member, it's raining men, review, shhot for the stars 2016, shoot for the stars, shoot for the stars 2016, video. Bookmark the permalink.